An upper low over the Balkans slightly deepens while moving east with a SFC low deepening over SE Balkans. A large upper trough with a lot of cold air remains centered over Scandinavia and NW Russia. To the WSW, the ridge remains over western Europe with a stationary upper low just west of Iberia. Active severe weather is likely from Bulgaria into NW Turkey. A MDT+ risk area has been issued for the eastern Aegean sea, NE Greece, NW Turkey and SE Bulgaria with threats for very large hail, severe wind gusts, heavy rainfall and tornadoes. A MDT risk area has been issued for extreme NW Bulgaria, SW Romania and E Serbia for heavy excessive rainfall. A SLGT risk area has been issued for large parts of central and eastern Mediterranean and Balkans with threats for large hail, heavy rainfall and severe wind gusts. 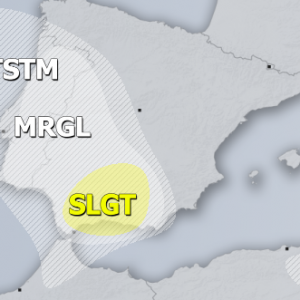 A SLGT risk area has been issued for E-CNTRL Spain for large hail, heavy rainfall and severe wind gusts.